January 5, 2003 -- Mac Mellor writing -- 1957 Tent 16 -- listed as Jencks, Brooks, A., Damon, K., Griepenkerl, Malm, C., McQuilkin, Biledeau, and Coupe D.
December 31, 2002 -- Mac Mellor writing -- I meant Sandy's left as he would see it. For us, Art is at 3 o'clock. Harry is definitely Harry. December 31, 2002 -- John Mercer -- Wow. This picture is causing more response than all others. 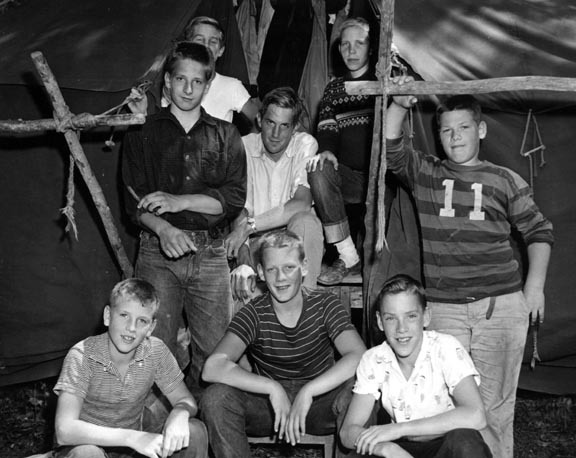 From the top, left is Carl Malm (maybe), right is Kent Damon; in the middle, left in dark shirt is Harry Bilodeau, center Sandy Jencks, right ("11") Art Brooks; at the bottom, left is Jock McQuilken, center Doug Coupe, and right Hammond Grippencurl. I'm sure of all of these but Carl Malm. December 30, 2002 -- Sandy Jencks writing -- This picture is from 1957, which as I recall was my last Year at Hyde Bay. The only one I recognize for sure is Harry Bilodeau in a dark shirt on my right, looking almost full grown already. But "11" must be Doug Coup, and I am pretty sure that Carl Malm, Jock McQuilkin, and Kent Damon are the front row, but I couldn't swear to that or say who was who. Odd, given that all of them were in my tent for at least three Years, maybe four! Do you know what became of any of them? December 29, 2002 -- Mac Mellor writing -- Art Brooks to Sandy's left. Top row left to right: Carl "Carlos" Malm, Kent Damon. Next row down: Harry Bilodeau, Sandy Jencks, Art Brooks. Bottom row: Jock McQuilken, Doug Coupe, Hammond Grippencurl.